If it were not for lavish government subsidies transferred to pro-Orbán propaganda news outlets, not a single Hungarian right-wing newspaper or publication would survive beyond a couple of weeks. Publications like the main government daily, Magyar Idők, would almost certainly go out of business in a matter of days were it not for transfers from public coffers, mostly in the form of government advertising. The propaganda publication does not permit for an independent audit by a third-party company of their subscription and sales numbers, but according to an estimate published by Zoom.hu earlier this year, the Fidesz print daily sells approximately 2,200 copies per day. Magyar Idők never contested the accuracy of an estimate that, if true, should be disastrous for the paper. Despite the fact that Magyar Idők is effectively moribund, last year the daily received 897 million forints in government subsidies, in the form of advertising. The absurdity of this volume of paid government notices in a paper thoroughly rejected by Hungarian consumers is stinging. Fully 87 percent of Magyar Idők’s advertising revenue comes from taxpayer funding. The situation at the other Fidesz propaganda daily, Magyar Hírlap, is not much better. The paper sells approximately 5,000 copies per day. Yet inexplicably here too, a publication rejected by consumers receives 637 million forints in government assistance. 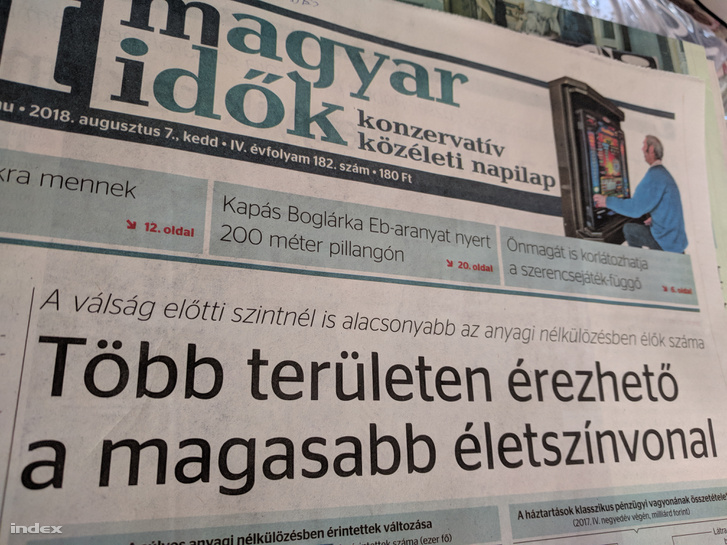 Magyar Idők issue from August 2018. As a point of comparison, according to an independent audit by MATESZ from the first quarter of 2018, the last remaining opposition daily, Népszava, sells 19,927 copies per day and received 260 million forints in government subsidies, through advertising. At that time the conservative opposition daily Magyar Nemzet had yet to cease publication and their daily sales stood at 13,365 copies. From the perspective of audience and public reach, the tabloid Bors and the free Lokál print publication are the most significant. But beyond the unprecedented party control of “private” media in Hungary and the ability to more effectively coordinate propaganda messaging directly from the Fidesz Politburo, the real significance here is that Fidesz is able to more handily transfer taxpayer money into the pockets of party businessmen. 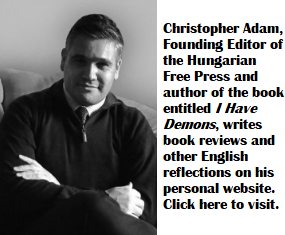 In a sign that nothing much matters anymore in Hungary, the public announcement about the media empire congregating under the Foundation was an expression of pride in the fact that moribund publications purchased by almost nobody will happily survive by more effective parasitical activity against taxpayers. Great woe and gnashing of teeth will one day, who knows how far in the distant future, befall the Hungarian right. When this blatantly corrupt and singularly arrogant regime collapses, Hungary will be left with not a single right-wing media outlet or publication. The political right, having become exceptionally comfortable living off government assistance and not even worrying about actually sustaining a readership, will have nobody to blame but itself. If Hungary has a “blatantly corrupt and singularly arrogant regime” how do you define US, Italy, France, Romania ,…. ? Ha! Indeed. Then what is the point? Oh yes, more diversion of our money to pro-regime supporters. The only consolation is that this regime’s media is basically produced by zombies and only read/watched/listened to by like-minded zombies. If it weren’t for the fact that my hard-earned tax forints are paying for this drivel, I could live with that fact.